5 Bedroom Detached House For Sale in Chesterfield for Guide Price £300,000. Blundells are pleased to present this five bedroom detached dorma bungalow currently split into two entities. 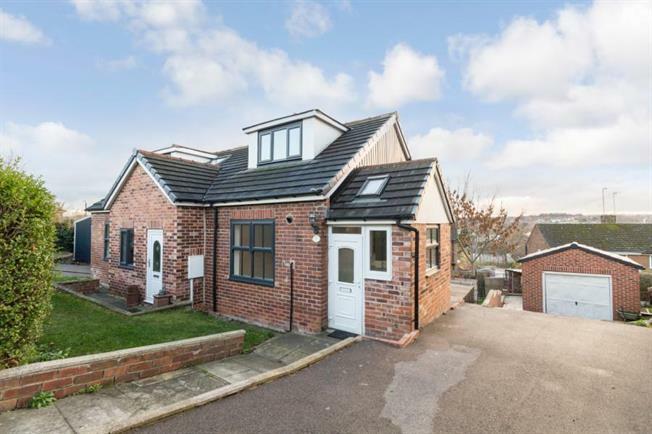 This is a one bedroom first floor flat with own entrance and a three bedroom ground floor bungalow style but with the option to convert back to a five bedroom home. The perfect investment opportunity or family home. The first floor flat has a ground floor kitchen with wooden effect wall and base units with dark work surfaces, upstairs is a large double bedroom with plenty of space for bedroom furniture, a white three piece bathroom with shower overhead and a large living/dining room with views of Chesterfield. The one bedroom self contained flat is neutrally decorated throughout and is currently tenanted. The ground floor is currently set up as a three bedroom flat which has been recently fully renovated. The kitchen is recently fitted with grey wooden effect wall and base units and dark work surfaces finished with contemporary and modern tiles and handles with space for a dining table. There are three double bedrooms and a large storage cupboard under the stairs that could fit a small desk. The recently fitted bathroom is complete with bath, low level flush and wash hand basin. The ground floor benefits from patio doors opening out onto the rear landscaped communal garden. There is a small studio annex at the rear of the property that has a small kitchenette and separate shower room with a maisonette above for storage; complete with patio doors opening out onto your own private parking and private access with secure gate. The property has plenty of off road parking. And a large landscaped communal garden. Old Whittington is a sought after village in Derbyshire only 2 miles north of Chesterfield and 10 miles south-east of Sheffield. With surrounding shops and close to the Whittington Moor Medical Centre. Old Whittington offers a range of Local primary schools such as Mary Swanwick Community Primary School and Whittington Green Primary School. Old Whittngton is approximately 2.8 miles from the Chesterfield Town Centre via the A61 route. Call Blundells Now to view this unique property!